Dean sends Draco a fruit basketThis is a list of all my stories that make up the Demented!verse, my Supernatural/Harry Potter crossover series. 32 Chapters - 103,130 Words. Summary: Harry saves the Winchesters from a Dementor attack, but the Winchesters aren't the only ones that need protecting. 30 Chapters - ~121,500 words. Summary: Harry invents a ruse in order to trick the Winchesters into visiting London for a much needed vacation, only it turns out he really does need their help. Behind the Scenes Part 1 and Part 2, give you a glimpse into my "process" - they include the original outline for Damned Demented Demons, and the "Cutting Room Floor" of Vile Violent Vacations. Part 2 has annotations to explain why I decided to cut the scenes. Summary: Sam and Scorpius play with a fire truck. PG-13, spoilers for 5x22 of Supernatural, all of Harry Potter, Vile Violent Vacations, and The Letter. Summary: Dean gets an unexpected visitor and we find out where Dean and George got to during the party in Vile Violent Vacations. Summary: Nate comes out, only it doesn't go as smoothly as he thought it would. PG-13, spoilers up until 6x11 of Supernatural, all of Harry Potter, Vile Violent Vacations, and The Letter. PG, spoilers for 7x03 of Supernatural, all of Harry Potter, recommend reading "Seers, Souls and Scandinavians" first. Summary: Till heals Sam, tricks Dean, and enjoys a cup of tea. Summary: Nate gets dumped, Teddy hasn't had much luck either. Summary: Nate starts to deal with his breakup, with help, of course. Summary: Till gets a medical file and a question from the Winchesters during the height of the Leviathan crisis. G, spoilers for HP, SPN S8, and all Purgatory, Prophets, and Potions. hi! i would just like to say that i read your story and it was holy shiz nick fantastic! i cant wait for the sequel! This was an excellent series, can't wait for your 3rd to come out. Cause NO WAY can you stop at VVV. Thanks! I'm not doing another epic (at least, not anytime soon), but I AM in the process of publishing a very long timestamp, that follows The Letter and To Being Half a Person. The first part is already posted, the second part will go up Tuesday night or Wednesday morning. Eventually (once I finish writing the final part) I'll post all the parts in quick succession. I just finished reading this series and I absolutely love it! I thought you did a wonderful job with the characterizations. I'm also really looking forward to reading more from this 'verse. Thank you for sharing it! I'm in the process of writing (and posting) another timestamp that's around 24,000 words. Once it's completely posted, I'll add it to this list and crosspost it to some SPN LJ communities. So, keep you eye out for it, if you haven't seen it already! just stumble upon this recently - and i have to tell you.. it's everything i could of wanted out of a harry potter story. the voices are PERFECT. and the fact that it's crossed with supernatural? that jsut makes you awesome. No to ways about it. You are awesome. - I was wondering though. Would it be alright with you if i printed them out, and bound them up to put on my bookshelf? Wow, thank you. I would be really flattered if you printed it out and bound it and put it on your bookshelf! Just so you know though, the web versions have less typos than the pdfs! It was something I was going to fix, but I still haven't done it yet. And by less, I just mean that I drop less commas mostly. Thanks for reading, and yeah...I almost wish you could send pictures over LJ, because I'd love to see my stories bound and on a bookshelf. That's just so flattering. This is one of the best SPN/HP crossovers I have read. And the end of VVV was heartbreaking and brought tears to my eyes. Not many writers can do that to me. I applaud your ability to make the "voices" of the characters ring so truly. 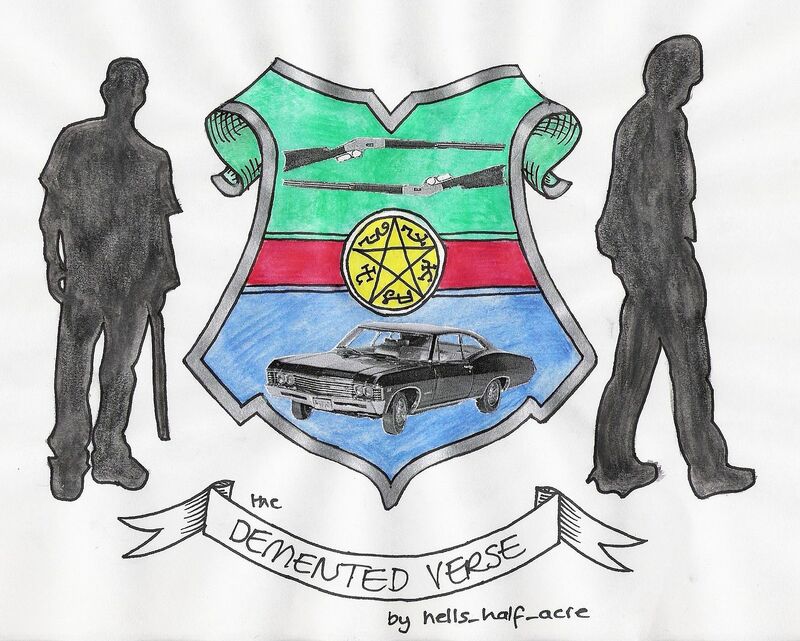 And where would I find the pdfs of your Demented!verse? I want them so that I can re-read them on my eReader. Kudos to you and your imagination. Thank you. I'm on my cell s this cant be a long comment but i saved the PDFs on my computer and i've just finished them both and i'm totally in love with this veres. The characters are spot on. Everything is totally believable and the hot issues (hunters, muggles, blood purity so on and so forth) were handled beautifully. You should be proud of your self this series is a major credit to both fandoms :) THank you for sharing it ! I'm in love with this crossover. All the characters feel so real, and their interactions are so sweet, and so heartbreaking. I also love the personality of the kids. Teddy is so cute, and Albus' answer to Harry in Seers was one of the best endings possible, and probably the only possible happy ending the Winchesters could get. Thank you so much! It means a lot to me that you like the end of Seers, because I agonized over it quite a bit. There may be more timestamps...we'll see...there's a half-completed one that's been sitting on my harddrive for the past 6 months, so I just have to figure out how to complete it. I just went back and read most of this verse! I think I noticed you had posted the most recent timestamp, and intended to go back and read it. And let me just say - what an excellent series! I haven't read HP fic in ages, but it was great getting to see the characters again. I rarely read such long gen fic, but I simply could not put DDD or VVV down. It really felt like a continuation of the HP books, just more adventures for Harry and the gang, with Sam and Dean thrown into the mix. And the way you blend the two worlds together is great. There's a lot of great potential for interactions between the characters, and I loved seeing that. The plot was so intriguing and, like I said, read like an HP book (only because the scope was greater than an SPN episode). But I loved the way you brought these two worlds together. Anyway, great work! Thank you so much! :) I'm really glad you liked it. And yeah, saying that it felt like a continuation of the HP books...well, that just makes me smile from ear to ear. I really love writing in this 'verse (as I'm sure you can tell). I don't really read HP fic, so writing this 'verse is really the only time I get to go back and hang out with those characters. Oh reading the Letter made me cry! This is a very good series. I love it! Hello! I just wanted to tell you that I think absolutely everything you've written in this verse (and...well, just about everything in general written by you) is absolutely fantastic! Making crossovers as realistic as possible is a challenge that I seem to really enjoy - so it's just a huge bonus when people appreciate the work I put into them too! Thank you so much for reading and the kind words.